Important Notice : Have you booked for the National Rally yet? Book your pitch now to be with other East Midlands members. Members - Have You Something To Sell? New Members or potential New Members? The Motor Caravanners’ Club is a club run by motor caravanners for motor caravanners and was founded in 1960. It is managed by a volunteer Council of Management and administered by 3 staff at Club HQ in Malvern. The East Midlands Group of the Motor Caravanners’ Club was founded in 1962 and covers the Counties of Rutland, Leicestershire, Derbyshire, Nottinghamshire and Lincolnshire and is run exclusively by volunteers in accordance with the Policies and Constitution of the Club. We arrange for Members to visit and stay for a few days at locations/venues that are specifically suited to our chosen leisure activity. These locations offer the opportunity for motor caravan owners to explore the local area whilst staying with other like-minded people on sites with facilities that vary from basic requirements to fully serviced pitches. For Members wishing to socialise, most of our sites will include the opportunity to meet other members at social gatherings. These too can vary, from a simple get-together of chairs outdoors to a hall hired with professional entertainment. Special occasions like Easter, Christmas, etc are usually enjoyed and celebrated with all that goes with the occasion. We also ‘theme’ some of our meetings to provide a variety of opportunity to enjoy occasions such as Halloween, Burns Night, St.George’s Day, etc. Any person owning or using a motor caravan can join the Motor Caravanners’ Club (MCC). As a MCC member you can attend any rally organised by the Club or any Group. Children with Parents and/or Grandparents are welcome. Members with mobility difficulties are also afforded as much help as it is possible for us to provide. Members of the Club from any Group are welcome to join us at our rallies, as are members of family or friends (provided that they stay in a member’s motor caravan with a current member). Pets are welcome. These meetings of our members are called ‘Rallies’ and this term is very often misunderstood to be a gathering of people following a set organised routine. This is not so. Members are afforded the opportunity to enjoy the local area and it’s attractions for a very reasonable pitch fee and are completely free to choose how they spend their time. Members are welcome to stay for the duration of the rally or just pop in for one night. Basic needs such as drinking water, toilet and waste water disposal are provided at all rallies and some rallies have access to toilets, showers and other facilities. On this website you can look at what is included at each site, just click on ‘Rallies’. We welcome all Members to our rallies and endeavour to make the stay enjoyable. We offer help to members attending for the first time and make local information available to all. 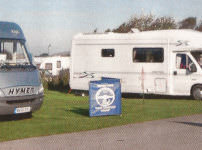 All Club Members receive the monthly magazine ‘Motor Caravanner’ plus an annual handbook and an annual rally booklet which provide a wealth of information on motorcaravanning, including rallies in the East Midlands, UK nationwide, Europe, Spain, Overseas Travel, Member Discounts, CL Sites, Night Stops, Motorhome Friendly Parking, Temporary Holiday Sites, etc. Should you have any questions regarding our Group, you will find contact Emails on the 'Committee' link on this website. We are always happy to receive email enquires and can arrange a follow up phone call if needed. 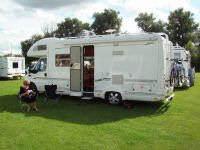 Interested in other Motor Caravanners’ Club groups that cover the UK and Spain, Then visit our parent website at https://themotorcaravannersclub.co.uk/ .